The concept of quantum mechanics is difficult to grasp when one is more familiar with a Newtonian view of the world. A good introduction to quantum mechanics/physics may be found in the programmes ‘Secrets of Quantum Physics’ introduced by Professor Jim Al-Khalili. These may be found on BBC iPlayer or via Amazon. The following books have been useful during the development of Schrödinger’s Clock®. 'Longitude' by Dava Sobel is a little gem that emphasises the importance of accuracy and precision in time-keeping instruments. John Higgs takes a look at the connectedness of ideas in the twentieth century, taking in quantum mechanics in ‘Stranger than we can imagine’. ‘Charlie and the Chocolate Factory’ by Roald Dahl’s book introduces the wonderful concept of the Square Sweets That Look Round. 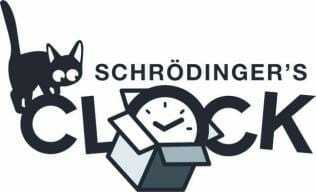 Schrödinger’s Clock® Always Looks Round (to see if it is being observed before deciding what time to display). ‘The Three Musketeers’ by Alexandre Dumas. The title for Chapter 35 ("All Cats are alike Gray in the Dark”) provides the quote for the image used in the Night mode for the app, when a face is detected.